Venture back to 1990 as we go holiday shopping on DAY 5 of the countdown. When TMNT unleashed its wrath of popularity on the world back in the 80s, the internet was in its infancy. There wasn't one kid in my school who knew what the word even meant. Cyber Monday was nonexistent. The only shopping you could do from home was ordering from a catalog. You'd scribble your desires on an order form, snail mail it back to the company, and ages later a package would arrive on your doorstep. 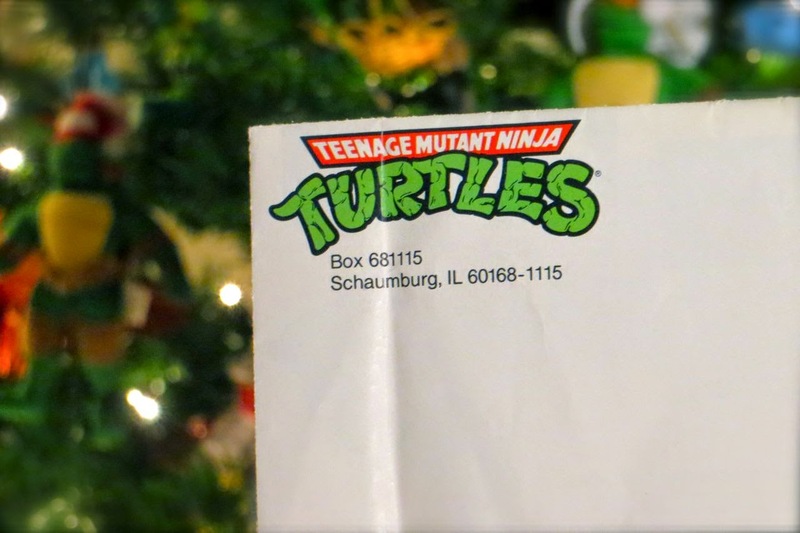 That ancient process hasn't gone extinct just yet, but the days of catalogs dedicated to TMNT have yet to return. But luckily, I found a Christmas Catalog dated from 1990, buried deep within my collection. Like a worn road map, it has tacked on excessive mileage. Years of repeated folding and unfolding have set scar-like creases into the aged paper. And it's beautiful. Every morsel of space is covered in mutant merchandise. My favorite is this hip woman forever trapped in the bounds of this 90s haven. The print on her rad satin jacket (only $38.50!) is partially covered by her frizzy, decade-appropriate hairdo. Behold the ancient and infamous order form. Although Pizza Points are an accepted currency in The Sewer Den, it seems like the 1990 Christmas Catalog did not accept them. On the plus side, Leonardo signed this thing! The catalog is packed with enough classic Turtle merch to send your jaw to the floor (and into the sewers). If I went through every item, we'd be here until New Year's Day. So in the spirit of retro holiday shopping, today's gift is a scan of the entire 1990 Christmas Catalog. Digitally thumb through and dream of all the gifts Santa could've brought you back in 1990. Check back tomorrow for DAY 6 of 24 Days of Turtle for more festive fun, gracious gifts, and possible prizes! Until then, stay jolly, dudes & dudettes! I have a few items featured in the catalog. Too bad they don't still have those!